The Perth Mint of Australia has released the fourth annual issue of one of its most popular series. 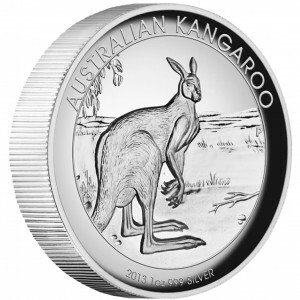 Available now from the Perth Mint is the 2013 Australian Kangaroo 1 oz Silver Proof High Relief Coin. As indicated by the name, the coin contains a high relief image of a kangaroo on its reverse. Each is struck from one ounce of 99.9% pure silver. "The high relief Australian Kangaroo coin represents the very best in minting excellence and design," describes a Perth Mint release. High Relief Kangaroo Silver Coins made their debut from the Perth in 2010. They have been issued annual since that release with the reverse designs changing each year. For instance, the 2011 High Relief Kangaroo Coin shows a left facing adult kangaroo on the reverse while the 2012 High Relief Kangaroo Coin depicts the marsupial in a traditional Australian bush scene. The reverse of the 2013 strike shows a single adult kangaroo in an outback desert scene, struck to high relief. The reverse design is the work of Perth Mint artist Tom Vaughan. Inscriptions include AUSTRALIAN KANGAROO, 2013 1 oz 999 SILVER and the Perth Mint's historic 'P' mintmark. Struck as legal tender of Australia, the obverse contains Ian Rank-Broadley's effigy of Queen Elizabeth II. Inscriptions include ELIZABETH II, AUSTRALIA and the legal tender face value of 1 DOLLAR. Specifications of the one troy ounce of silver coin include a minimum gross weight of 31.135 grams. Maximum diameter is 32.60 mm with a maximum thickness of 6.00 mm. Mintage of the single coin release is limited to 19,000 with maximum mintage of the strike stated as 20,000. Each coin is housed in a Perth Mint display case and ships in an illustrated shipper along with a numbered certificate of authenticity. 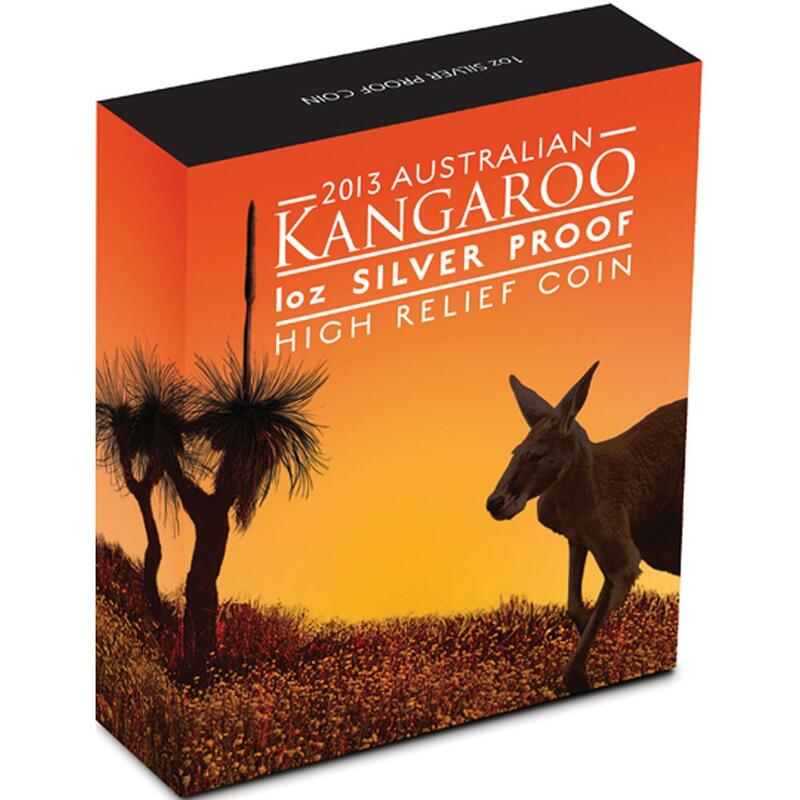 For more information, or to purchase a 2013 Australian Kangaroo 1 oz Silver Proof High Relief Coin, please see the affiliate link below. Current pricing is shown as AUS $ 87.27 (US$ 80.06), but is subject to change.